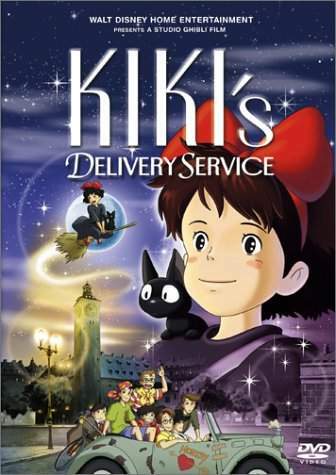 Kiki's Delivery Service is the story of 13 year old girl named Kiki who is a witch in training. Along with her black cat Jiji, she travels to a far away city by the ocean named Koriko. At first, everyone that she met in the town didn't like witches, that is, until she met Mrs. Osono. Mrs. Osono is a married, mother-to-be baker at the Gutiokipan Bakery, and she and her husband allow Kiki to stay in their spare room in the attic for her year-long training session. In return, Kiki must help them in the bakery when she's not making deliveries via broomstick. Kiki also meets a boy named Tombo, who is obsessed with aviation. Later on, Kiki saves Tombo's life when he falls from a dirigible. Kiki's Delivery Service is a delightful story that has rich animation and French music. It takes place in France around the time of World War II, although WWII doesn't exist in this movie. This movie is actually based on a book by Eiko Kadona.